Francesco Evangelista, an assistant professor of chemistry in Emory College of Arts and Sciences, has won the 2017 Dirac Medal, one of the world’s most prestigious awards for theoretical and computational chemists under 40. The World Association of Theoretical and Computational Chemists (WATOC) announced the award for Evangelista’s work developing computations that focus on describing the properties of molecules and electrons and predicting how they will interact. Stefan Lutz, chair of the Department of Chemistry in Emory College, says Evangelista’s efforts contribute to a conceptual understanding of chemical reactivity and provide the theoretical predictive framework that offers invaluable new insights for the experimental sciences. To be honored with the Dirac medal signals that those contributions make Evangelista a rising star in the field, Lutz says. Evangelista came to Emory in 2013, having previously researched the role of electronic excitations on chemical reactivity. The equations used in the work are too complicated to be solved manually, prompting the need for the use of computers. Evangelista says he is humbled by the award, which is special because it’s named after one of his scientific heroes, physicist Paul A.M. Dirac. He is also excited about what the recognition will mean for his collaborations with colleagues such as Emory chemistry professors Eilaf Ergap and Tim Lian, studying ways to harvest and convert solar energy into chemical fuels. WATOC President Walter Thiel says the organization has recognized innovative research among junior scientists since 1998. 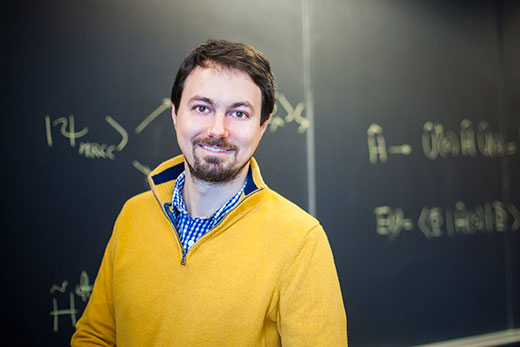 This year, Evangelista’s work on advanced state-specific multireference coupled cluster theory was recognized as the best among research by top junior scientists around the globe. “As in the case of previous Dirac medalists, the WATOC Board is convinced that Francesco has a bright future in fundamental research and will become one of the world leaders in the field,” Thiel says. The organization will formally present Evangelista with the medal at its Congress, to be held in August in Munich.